Walking is so last-century it seems. And more and more people “in the know” in the U.K. are zipping around town on the AirWheel, an electric unicycle that will travel up to 24 miles on one charge. 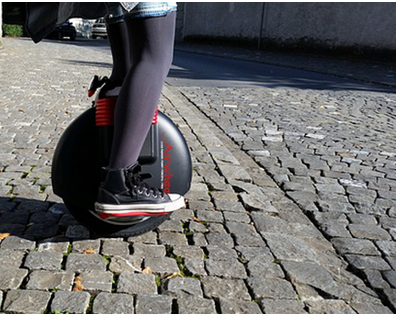 Made by company AirWheel, the AirWheel is a bit like a Segway, without the comfort and security of handlebars. Basically, you just hop on and go—leaning forward to move, back to stop and left or right to turn—or so the maker says, declaring anyone can be proficient in a day or two of use. But hold on (actually you can’t hold on, because there’s nothing to hold onto), it’s not so easy, writes Marianne Power in the Daily Mail, who took one out for a test roll. Just getting on was almost impossible for her, she said, because the Air Wheel is basically a big wheel with footrests on either side of the wheel, and there’s nothing to keep it from moving as you climb on. Once you do actually get balanced on the AirWheel, you can zip around town at speeds up to 14 miles per hour. The biggest problem, though, according to Power is stopping. The AirWheel says all you need to do to stop is slow down enough so you can step off and then grab hold of the wheel before it falls, “but going slowly means wobbling, so I panic(ked) and jump(ed) off instead,” she wrote. As could be expected, the AirWheel is fairly portable, weighing in at just 28 pounds, roughly the weight of a fold-up bicycle. And despite Power’s rather difficult experience with the AirWheel, the reviews online so far have been outstanding, with users buying them to walk their dogs or just to take a “stroll” around the park. At the very least, using the AirWheel will get you where you want to go faster than walking—if you don’t fall off.